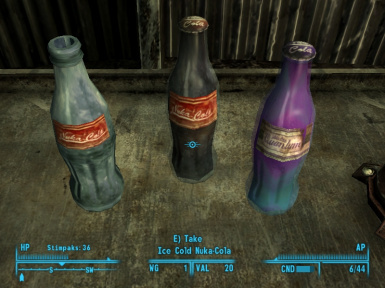 Re-Textures for the Nuka-Cola and Nuka-Cola Quantum, based on Skykappa\'s mod. Skykappa for creating the original textures. Added NMM installer with all versions. 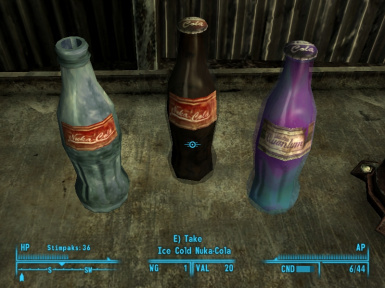 The fact that the Nuka-Cola Quantum doesn't glow on my PC bothered me A LOT (even with HDR on). 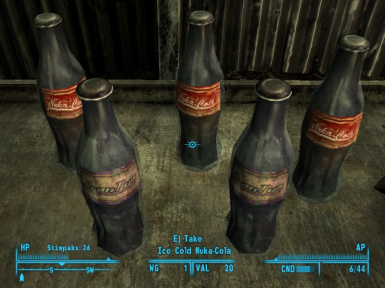 I looked for solutions for a while with no luck, and I finally ended up downloading Skykappa 3000 mod, which provided a re-texture for the Quantum, as well as for the Nuka-Cola and the Empty Nuka-Cola bottles. I then made a few changes to better suit my tastes, and I thought others might enjoy using these. 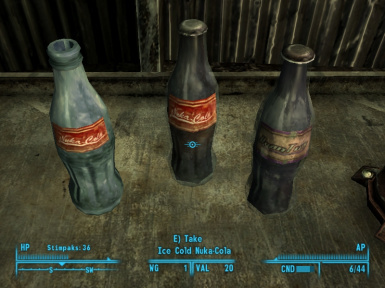 I wasn't going to upload this because anyone can download Skykappa's mod right here on the Nexus, but then I decided it could be useful for some people to have a mod with just the textures for the Colas, and with a few options to choose from too. Anyway, this is my first re-texture (of a re-texture) so enjoy. Option 1: these are Skykappa's original textures. 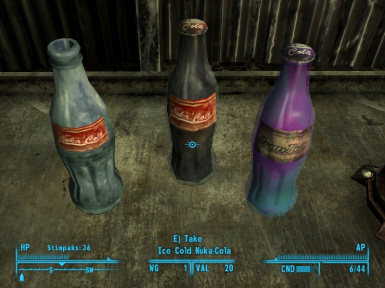 I added these in case you just want his textures but don't want to download the rest of his mod. All credits from this goes to him, so be fair and thank him. 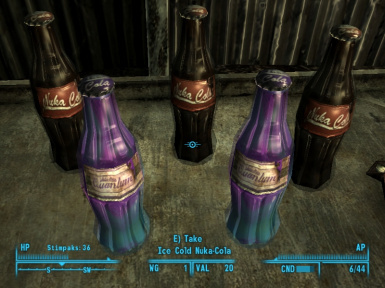 Option 2: same as Option 1 except for the brightness of the bottles (vanilla), and the label of the Nuka-Cola (vanilla label slightly changed). Option 3: same as Option 2 except for the label of the Nuka-Cola Quantum (vanilla label slightly changed). 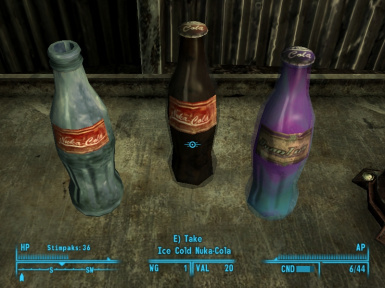 Option 4: same as Option 3 except for the texture of the Nuka-Cola (vanilla textures but with the Bottlecap changed). 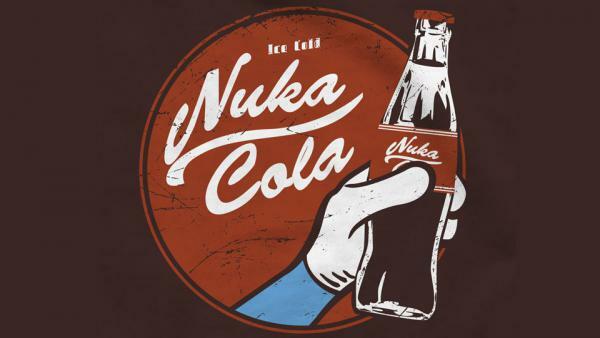 Option 5: same as Option 4 except for the label of the Nuka-Cola Quantum (Skykappa's original label). 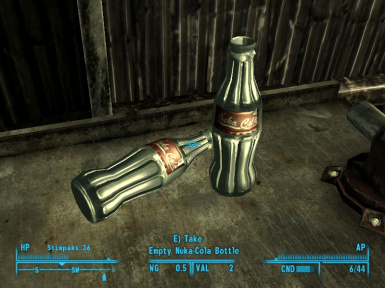 2) Select the option you want from one of the folders, and copy the "Textures" folder to your \Fallout 3\Data directory. 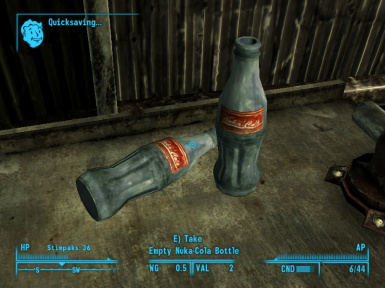 Fallout 3 Nexus for creating a place to share our mods.